Could you survive a nine-month road trip with your family? 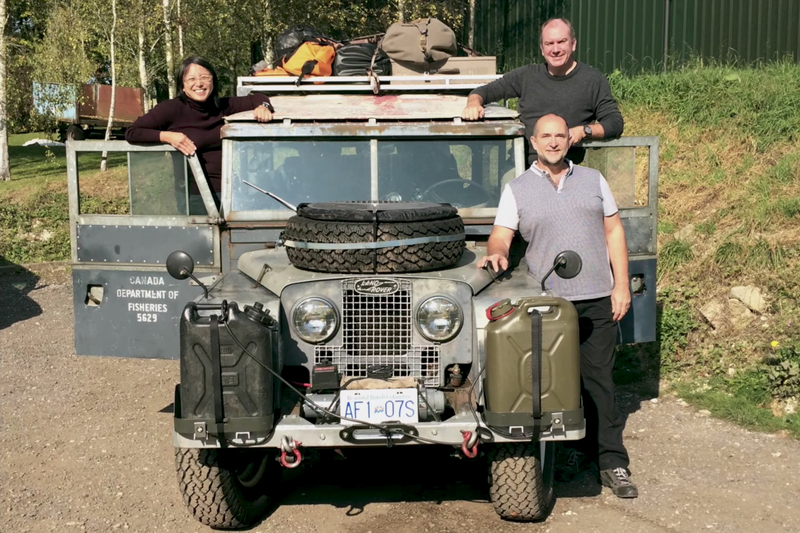 The Hyland family of five drove from London to Singapore in a 1954 Land Rover. They took the family road trip to all new heights! The Hyland family traveled more than 16,000 miles from London to Singapore from mid-summer 2015 to spring 2016. They managed this feat in a tiny 61-year-old Land Rover found in a Canadian farmer’s field and purchased for $300. Ray and Marianne Hyland, along with their three teenage boys, not only survived a massive nine-month road trip but thrived in every sense of the word. 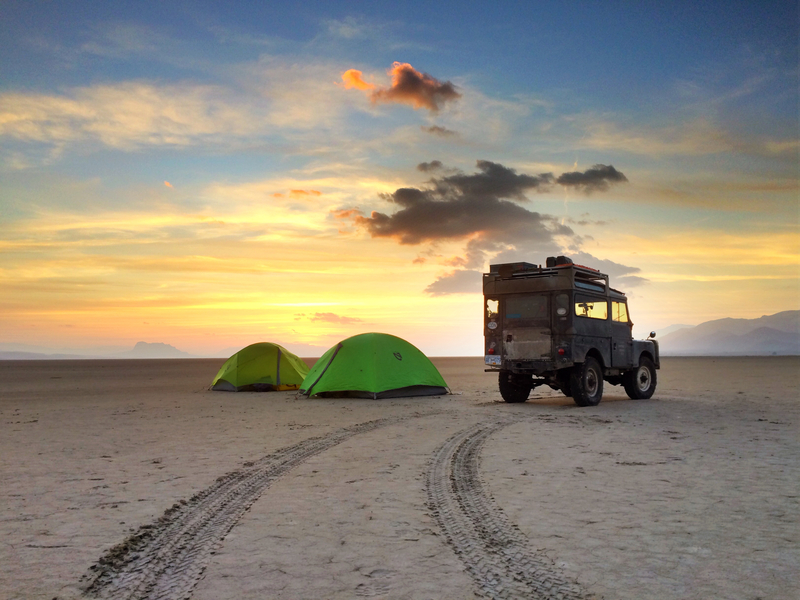 As Land Rover celebrates its 70th anniversary this week, let’s have a look at a modern adventure family that fully embraces all things Land Rover. The Hylands set out on this overland journey on the 60th anniversary of the 1956 London to Singapore “Oxford and Cambridge Far Eastern Expedition” in nearly the same exact vehicle. It was the first time a vehicle had traveled the entire route from London to Singapore. The original route went through England, France, Monaco, Germany, Austria, Yugoslavia, Greece, Turkey, Syria, Iraq, Iran, Afghanistan, Pakistan, India, Nepal, Burma, Thailand, Malaysia, and, finally, Singapore. The trip took six months and six days to complete, traversing 18,000 miles. The Hylands’ route was a bit different than the original, spanning 16,000 miles. It took them through England, Ireland, Scotland, France, Monaco, Italy, Greece, Turkey, Iran, UAE, India, Burma, Thailand, Malaysia, and Singapore. They couldn’t visit Syria, as it was in the middle of a civil war. But with a huge stroke of luck, Burma had just opened its borders to travelers after many years of civil unrest. Burma opening its borders was a large impetus to do the trip. The original expedition was done in two 1954 Land Rover Series 1 86-inch Station Wagons. It was the first year Land Rover offered a wagon model. The Hylands have been a Land Rover family for years, owning a wide range of the brand’s vehicles. They purchased an old Series 1 from a farm in British Columbia, Canada, for just $300 in hopes of getting it back on the road. After investigating, they learned their vehicle is one of only three 1954 Series 1 Station Wagons known to exist. The $300 Land Rover was in rough shape when the Hylands got their hands on it. It needed a ton of attention and new parts to make it road worthy again. Luckily, the family is mechanically capable, and the simple old truck was relatively easy to work on. 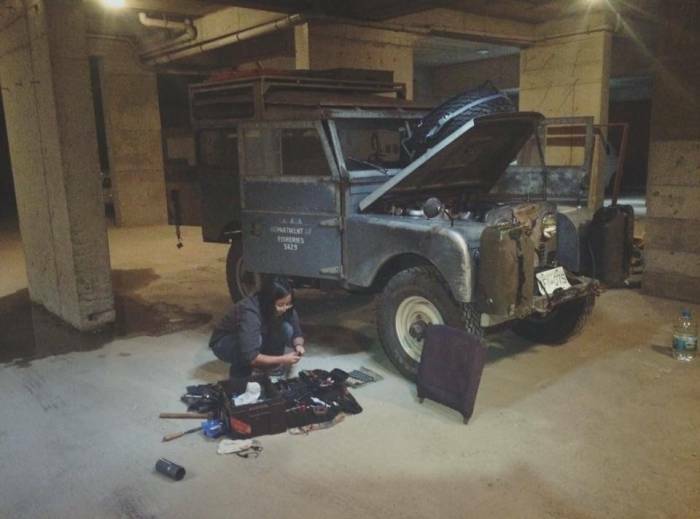 Besides replacing the bigger parts that were missing or broken, like the doors and windows, the Hylands did just enough to get the old Land Rover running again. Then, they fixed the other issues as things broke along the journey. “Our truck was terrible. It broke down every single day,” said Ray Hyland. They added a few simple, inexpensive upgrades to make the truck slightly more capable of completing the journey ahead of it. They sourced an old Astro Van rear bench seat off Craigslist for $25 so the three boys would have a more comfortable place to sit. General AT2 tires were fitted to better handle the long paved sections of the route while still being durable and capable off-road. Besides those small modifications, this old Land Rover was the same as the original expedition’s vehicle. The Hylands packed light and small in the underpowered Land Rover. They needed to be comfortable living in a tight space for extended periods of time. One big way they kept things light, small, and simple was through their chosen sleep/shelter system. They had a Nemo Dagger two-person tent for the adults and a Nemo Galaxi three-person tent for the kids. They used Nemo Tango backless bags for the kids, and the adults shared a Tango Duo. To complete the system, they used Nemo Fillo pillows and stuffed Nemo Zor pads under a Nemo Pawprint snap-in tent liner inside the tent. The Pawprint provided the comfort and feel of a fitted sheet. 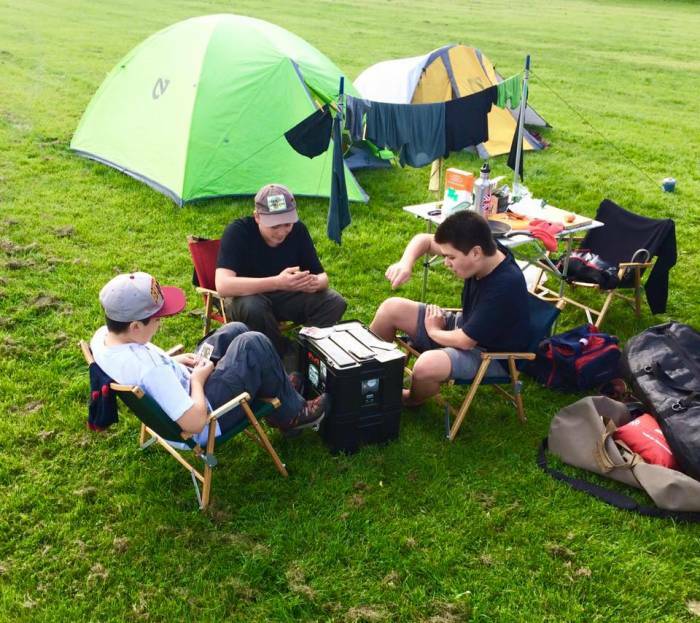 This lightweight backpacking setup saved the family a ton of weight and valuable storage space. Cooking along the way was essential to keep costs low and allow for remote camping. The family ate a lot of rice and claim it’s the “ultimate camping food.” It’s nutritious, filling, packs small, doesn’t go bad, and can be combined with a wide variety of other ingredients to make tasty, diverse meals. Rice can be difficult to cook well in conventional camp pots. Most are really thin, and the rice burns and sticks to the bottom. To get around this issue, the Hylands chose the Snow Peak Aluminum Caldero, a cast aluminum pot with a thick bottom, for more even heating. This pot is not small, but the Hylands found a perfect out-of-the-way home for it. They stored it on the hood of the tiny Land Rover, inside the spare tire and under the Front Runner grill. An MSR DragonFly stove heated the big pot. They chose it for its ability to run on various fuels, reliability, and its true simmer function — a critical feature to properly cook rice. While noisy, it also packs up pretty small and is lightweight. MiiR stainless steel pint glasses, an MSR plate set, and a large Platypus GravityWorks water filter rounded out the cooking kit. Nearly all the Hylands agreed that the most important gear on the trip was the Kermit chairs. These lightweight canvas-on-wood-frame camp chairs pack up small and set up quickly. They provided invaluable comfort for roadside lunch stops and around camp, especially after long days in the hot, cramped little Land Rover. Each person got to bring two sets of clothes with them: one on their back and one spare. They chose ExOfficio synthetic underwear and tees as well as Clothing Arts pants and shirts. These key pieces are all durable, easy to wash, dry quickly, and are comfortable in a variety of environments. Each person also got their own small duffel-sized dry bag. That small bag contained all their personal items, including their change of clothes. The personal item dry duffels were strapped to the roof during transit, keeping them out of the tight confines of the Land Rover’s interior and protecting their contents from dust, water, and general road grime. Old vehicles require lots of tools, spare parts, and fluids to keep them moving. The Hylands managed to pack all their tools, spare parts, and fluids into one Front Runner Wolf Pack. An impressive feat with all that they needed to bring with them! 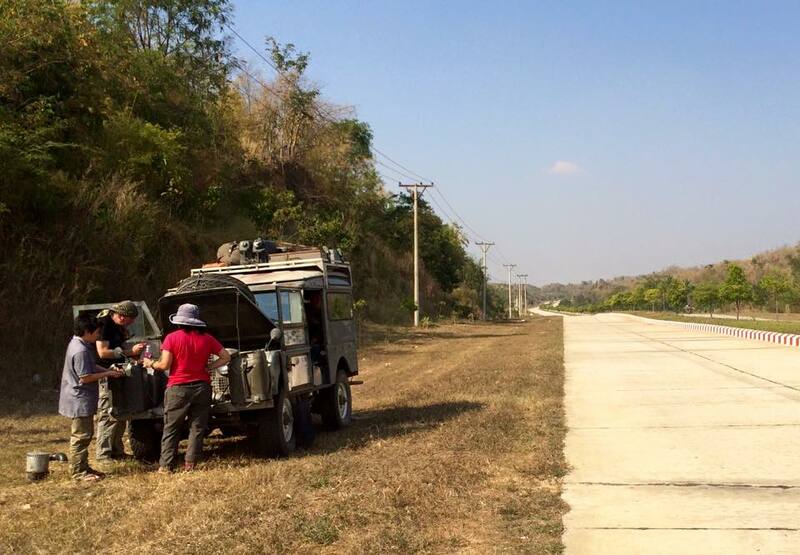 The old Land Rover leaked so much oil that they needed to continually buy it in bulk along the route. And it didn’t fit in the Wolf Pack. The leaks got so bad that they resorted to using thicker and thicker oil, eventually getting 50-weight oil in gallon jugs from agriculture shops. While the trip was about family and retracing an iconic expedition’s path, the people the Hylands met on the way profoundly impacted them. The family made the conscious decision to trust people on this trip, and it worked out. They had no issues with theft, bribery, or muggings. 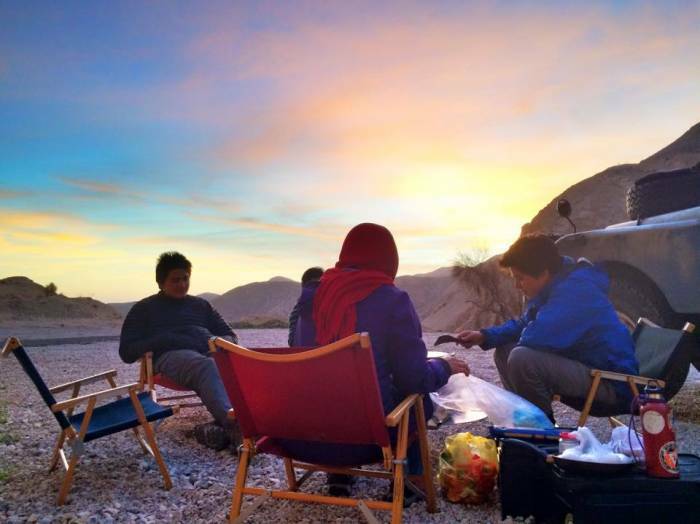 Iran offered up some of the best remote camping and friendliest people of the entire route. Besides all the generous, smiling people they randomly bumped into, they also regularly reached out for help online. 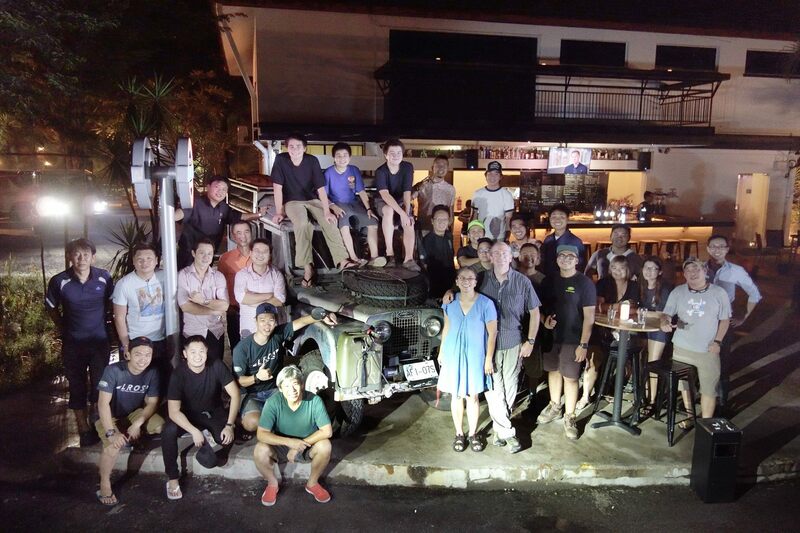 Facebook was an amazing tool to connect with Land Rover groups, overland travelers, and mechanics on their route. The hospitality of random strangers was something to behold. They stayed in a free villa for a week in Dubai. They even started the trip with free use of a Land Rover Defender 110 in England when their truck was delayed in shipping. If you want to know more about this amazing journey and inspiring family, be sure to check out the NW Overland Rally and BC Overland Rally. The Hyland family runs these gatherings of the overland tribe and regularly spins amazing adventure stories around the campfire. On occasion, they’ve also been known to show up with their little old 1954 Series 1 Land Rover Station Wagon. The truck has now traveled most of the way around the globe and still runs — sometimes.